A major hindrance to a healthy lifestyle revolves around blood sugar levels. GlucoChrom helps you maintain this aspect of your health. GlucoChrom is a unique combination of chromium, vanadium, bitter melon, and gymnema sylvestre. These substances have been used both traditionally and by health practitioners for years to help maintain healthy blood sugar levels. Working together, they provide the body with a natural way to balance blood sugar levels. 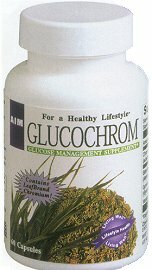 GlucoChrom is the first AIM product to use a unique and revolutionary method for delivering chromium to the body. This product uses barley grass as a natural delivery system that integrates chromium into the matrix of the plant through a proprietary process. This plant-bound chromium is recognized by the body and is extremely well-absorbed. We are in essence, using the logic of nature and our bodies to achieve this. In the case of GlucoChrom barley grass is grown hydroponically (where nutrition is supplied through liquid rather than soil). At the right time in the growth phase, we use a special process to alter the growing environment and increase the level of chromium. We are thus able to grow barley leaves that contain the amounts of chromium we specify. There is no hybridization or genetic alteration. The chromium we supply from this process is called LeafBrand chromium. We cannot overestimate the importance of this type of delivery system. Traditionally, many mineral supplements have been made from inorganic minerals?those that have been mined from the earth or developed in a laboratory. Only a small portion of inorganic minerals is assimilated by the human body. In creating our LeafBrand chromium, we use a plant?the ideal mineral factory. Plants take up both inorganic and chelated minerals and convert them to small, water-soluble molecules. Plant-bound minerals have been found to be more soluble in simulated gastric and intestinal fluid and therefore are potentially more bioavailable than other supplements. GlucoChrom , through LeafBrand chromium, provides standardized and easily and efficiently absorbed plant-bound chromium to the body. Close tightly after opening and store in a cool, dry, dark place (70-75 �r; 20.1-23.8 �m). Do not refrigerate. Who should use GlucoChrom ? Anyone who is at risk for high blood sugar or Type II diabetes should consider using GlucoChrom . Is there anyone who should not use GlucoChrom ? Children, pregnant and nursing women, and Type I diabetics should not use GlucoChrom . Those withType II diabetes or those taking oral hypoglycemics or insulin should consult a health practitioner before using GlucoChrom . Can I take GlucoChrom with other supplements or medication? Those taking oral hypoglycemics or insulin should consult a health practitioner before using GlucoChrom . Weight and Type II diabetes are linked. Can I use GlucoChrom or AIM?s Glucose Management Program with the AIM SlimMetrix Weight-Loss Partnership or the SlimMetrix products? You may use the programs or products together. However, as GlucoChrom and the SlimMetrix booster are both chromium-based products, you need only take one or the other. We hear a lot about the harmful effects of a poor diet on our health. We hear about how it leads to obesity, how it can lead to increased risk of cancer and cardiovascular disease, and how it can mean overall poor health due to lack of nutrition. Another risk of an unhealthy diet?especially if it includes large quantities of carbohydrates and simple sugars?is what it does to our blood sugar levels. The amount of sugar in the blood is largely controlled by the hormone insulin. When the body recognizes that we are eating and turning food into sugars, the pancreas secretes insulin. Insulin acts as a travel guide, escorting sugar through the bloodstream and then ?knocking on and unlocking the cells? doors? to allow glucose to enter. When the pancreas, insulin, and the cells are not working in harmony, the result can be diabetes?high levels of blood sugar. Insulin-dependent diabetes, known as Type I diabetes or juvenile-onset diabetes, is caused by damage to the pancreas. Part of the pancreas, beta cells, manufacture the insulin that escorts blood sugar to the cells. If beta cells are not working, or not working well, you do not produce enough insulin?there are not enough ?travel guides? to get the blood sugar to the cells. The result is that the blood sugar remains in the bloodstream?high blood sugar levels. In noninsulin-dependent diabetes, known as Type II diabetes or adult-onset diabetes, insulin is produced, but the cells remain resistant to it?you might say they keep changing the ?locks? so that the insulin cannot bring in the blood sugar. This also results in high blood sugar levels. Type II diabetes is by far the most prevalent, accounting for 90 to 95 percent of all diabetics. Chromium increases the ability of insulin to bind to cells and leads to increased insulin sensitivity of body tissue. This leads to the body being better able to absorb and use the blood sugar. In other words, chromium helps the insulin ?travel guide? get to more doors and oils the key that the travel guide uses to unlock our cells to the blood sugar. Studies have indicated that chromium does lower blood sugar and insulin levels in those with Type II diabetes. Although as early as 1899 it was found that a form of vanadium resulted in a decrease in blood sugar levels, it was not until the late 1970s that vanadium?s insulin-like action was first described. Vanadium may activate insulin receptors?making the cells more receptive to insulin?s ?key? ?and through this, exert insulin-like action. Bitter melon does much the same as chromium: it improves the body?s ability to use blood sugar and improves glucose tolerance?that is, the body?s ability to get the blood sugar into the cells.